Before the iPod and shuffle, the only option if you wanted to flit randomly between musical styles was a compilation CD or a multi CD changer, a machine that once stuffed with your favourite discs would seamlessly blend from one album to another with only a great clanking noise to hint at the switch. The only other choice was the “producer” album or to give them their official name “faceless producers”. In the late eighties and early 90’s they were everywhere, Coldcut, Bomb The Bass, S’express, Beatmasters, and later Leftfield. The music critics hated them, sniffing that their albums weren’t cohesive and sounded like a collection of singles by various artists. Me, I couldn’t get enough…painting a Coldcut mural on my bedroom wall and lapped up Go-Go tracks, jumping to reggae, acid house, a bit of hiphop, Mark E Smith next, oh now Yazz. Life was sweet. I’m not suggesting Dan Le Sac’s forthcoming LP marks a return to the days when “featuring” was the most popular word on the charts or the comeback of the faceless producer (for a start I’ve met him and he definitely had a face). 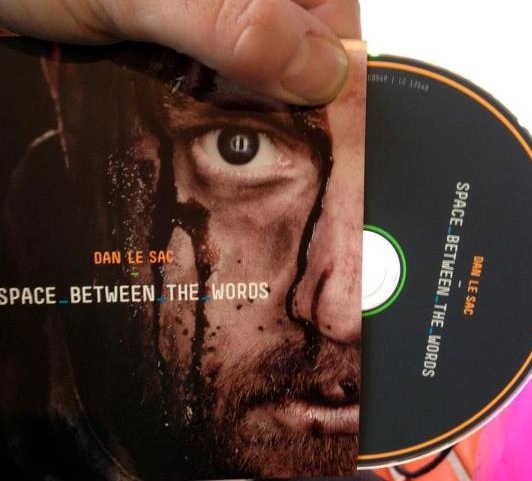 The title “Space Between The Words” doffs its hat to Dan’s part as one half of “Dan Le Sac vs Scroobius Pip” and the difficulty of going from the bloke behind the bloke with the beard to the bloke without the bloke with the beard. Thankfully Sarah Williams White who features on “Play” makes up for what I’m presuming she lacks in the beard department with a set of fine pop pipes (check out her Soundcloud page). As I seem to have got temporarily stuck in 1989 it brings to mind Kurtis Mantronix returning with “Got To Have Your Love” or the cheeky pop dance of Cathy Denis telling Dancin’ Danny D to “Come on and get my love“. The full album (out July 9th on Sunday Best) features a cornucopia of talent that hopefully hints at the genre hoping pleasures to be found within. Emmy The Great, Merz, Sarah Williams White, Joshua Idehen, Pete Hefferan (from Pete & The Pirates) and most excitingly for me at least, two tracks with the mighty B Dolan. I say hopefully as I haven’t actually heard it, a fact that cruelly illustrates that I’ve somehow slipped behind comedian Marcus Brigstocke as a goto source for upfront pop, indie, dance previews. Ok – the new @danlesac album is not what I’d expected at all – mixing up the styles. It’s brilliant. Amazing collaborations. Not that I’m knocking Marcus. In fact I also follow @MichaelMcIntyre for his unrivalled knowledge of UK HipHop, while @SandyToksvig is a surprisingly good source for Gabba. The poet Joshua Idehen also features on Dan’s LP which as good an excuse as any to give a mention to his main band Benin City. Their insanely funky old school Shady Groove style tune “The Beat” actually featured in the upper reaches of my Top 100 tracks of the year in 2010, but “Baby” is their first official single. It has an odd but charming video (above) featuring Deanna Rodger’s being followed round by a man with a Zebra’s head while the song itself can be filed under bitter-sweet love songs. Its actually far more bitter than sweet, being an ode to fucked up love but delivered with such a slow building beauty and mournfulness that it knocks you sideways. LV, who Joshua collaborated with on last years “Routes” LP has also remixed “Baby”. Benin City recently deleted their entire back catalogue from SoundCloud but if you’re quick you might just be able to nab The Beat for Free on Last.FM. Alternatively watch this live video for “The Beat” which reminds me every time I see it that I really need to go see them play. One of the original members of Benin City, poet and football writer Musa Okwonga also has new music out in the shape of “The King’s Will” an epic “Poetronica (c) The Guardian” project with producer Giles Hayter. “Love, Against Homophobia” first surfaced at the turn of the year but couldn’t be more timely with President Obama coming out in favour of Gay marriage. To his credit Jay-Z has also backed Barack, which could be controversial given an element of Hip-Hop’s attitude to homosexuals, along with Jay-Z’s slightly questionable lyrics in the past. An old post asking whether “Hova was a Homophobe?” got over a 1000 hits in 24 hours so its clearly caused something of a storm. At least it’s unlikely to cost him the presidency which could potentially happen to Obama, but as someone much wiser than me once said, sometimes you just have to do the right thing, not the popular thing. While we’re on a rambling path taking in some of Dan Le Sac’s collaborators I’d point you in the direct of former Pirate, Pete Hefferan’s Soundcloud page and “Dust” in particular. As I said earlier its well worth listening to Sarah Williams White’s solo Soundcloud. Here’s a Paul White remix from a year or so ago. Follow Dan on Facebook or Twitter for musical tipoffs like this absolute moster from Bobby Tank. Available to download for free here – http://bit.ly/JOHDXD.